Solidify your brand along all of the most popular social platforms quickly, by seeing instantly if your brand or screenname is available on all sites all at once. Find the hottest topics being searched for both on Youtube & Google. If you create quality researched content around these topics with your own flare you will drive more traffic from google. Once you find your topic for your content creation, type in words or phrases you think would be related to it to find options for your video tags that include monthly numbers of average searches for the specific tags & keywords. Start creating an email list from day one, put a sign up form on your brand tied website. If you dont have a website create it after you search knowem.com to maintain the same name & brand presence as on all your other social media platforms. This is important because youtube will only send notifications to some of your subsribers & you will only be posted in some of their subscription feeds. Control the distribution of your content. Simple screencast software that anyone can easily use & understand, allowing you to do how to videos & tutorial/ walk thrus & giveaways; then upload your video directly to youtube. This is a barebones free version but it gets the job done. Open Broadcaster Software -Free, open source software for live streaming and recording This has all the bells & wistles that screencastomatic doesnt, still for free but it is for the more technically savvy. You can overlay your logo, resize the webcam video and make many adjustments!! This allows you to see the TAGS used on any particular video, which will help to see what your competition is using in a particular genre or video type. THIS IS A CHROME EXTENSION. It also shows you the social stats on like, shares tweets and the like. This helps you to learn how to optimize your own videos. To use this for free your channel or another one you create has to be under 1000 subscribers. 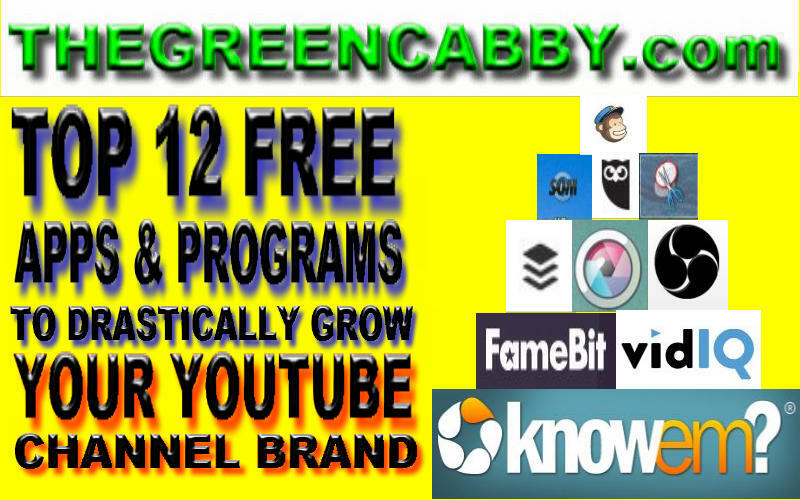 Once you have gotten all these apps & programs down you should be well on your way to 1000 Subscribers. Once you hit that mark you are eligible to use FameBit. The main reason in this article to use the service is that you can find free collaborations for like minded youtubers. Which means shoutouts, shared play-lists & video collabs. This gives you the opportunity to garner alot more traffic towards your channel to hopefully increase subs, views & watchtime. BONUS ALERT - Check Out Windows SNIPPER TOOL or google an alternative snipper tool that will allow you snip or crop screen captured images that you can use in your thumbnails! Hopefully this info has been helpful, As I wish I would have had a list like this when we started out to build our channel from the ground up. If you do find this helpful please share it on GOOGLE+ FACEBOOK TWITTER or PINTREST so that others may benefit from the compiled information that has helped us so much.